October 3rd is celebrated as Mean Girls Day by fans of the hit millennial film. Tina Fey, the creator of said film announced on October 3rd 2016, over a decade after the film’s release that a theatrical production of the same story is in the works. As promised, Mean Girls the Musical is all set to open at the National Theatre in Washington in October 2017. The Musical is one of the most anticipated shows of this year, and you have the opportunity to watch it as well. Mean Girls tickets are available now for the show’s National Theatre run this fall. At the face of it, the creators of this theatrical rendition are keeping close to the original story. As a result, the play pays homage to the film as well, by collecting a new cast and using celebratory classical Broadway music in order to depict the work created over a decade ago. Audiences can expect Fey’s quirky, eye-opening humor. Since her characters often break the fourth wall, immediate audience engagement can be expected as well. Mean Girls the Musical is produced by Stuart Thompson and Lorne Michaels, with a book by Tina Fey, music by Jeff Richmond and lyrics by Nell Benjamin. This list of people is more organic than one would think at first glance. Lorne Michaels is a long-time collaborator with Tine Fey, working closely with her on 30 Rock and Saturday Night Live and Thompson is a comedian from Fey’s circuit. Jeff Richmond is Fey’s husband and has also collaborated with her on the original film and other works of hers. Nell Benjamin wrote the soundtrack of the film Legally Blonde which is also considered another iconic satirical chick-flick. While the cast has yet to be announced, Fey has mentioned that the actors have been finalized and rehearsals are in session now. Under the tutelage of director and choreographer Casey Nicholaw, Fey has high hopes from these performers to put up a stunning show. While the show is being rehearsed in New York and is eventually Broadway bound, the Musical’s world premiere is scheduled in Washington DC, at the National Theatre where it will have a consistent run. Just a few blocks from the White House and established in the 1800’s, The National Theatre has hosted Presidential inaugural balls and staged some of the best theatrical productions in the world. John Lithgow, Judi Dench, Kevin Spacey and Sir Ian Mckellan are just some of the names from modern celebrated actors who have graced the National Theatre with their talent. The individuals that make up Mean Girls’ team have a good reputation in American theatre. Their contributions to stand-up and theatrical comedy are well-known. Therefore, the promotional activities surrounding Mean Girls are contributing towards a positive spirit in theatre. For example, its Washington run provides an opportunity for theatre-goers to purchase a theatre pack, with a ticket to Mean Girls, Les Misérables, Something Rotten! and Waitress at the National Theatre along with Hamilton at The Kennedy Centre Opera House. While these allow ticket-buyers to purchase discounted tickets to all of these shows, they also allow for different productions to support one another and increase goodwill in the community of theater. Fans of the movie had been asking for a sequel or reunion of some sort soon after they had watched it. However, for the longest time, the cast and creators would not provide any news. October 3rd has been proclaimed Mean Girls Day in keeping with the movie’s character Aaron Samuels asking Cady the date in a scene. On Mean Girls Day in 2015, Tina Fey announced what fans had been asking for all this time; a Mean Girls Musical. Now, nearly two years later, the production is near-to-complete and set to premiere this fall. Mean Girls tickets are available now, if you would like to become a part of this highly anticipated experience. Some of the best theatre productions have released their schedules. Mean Girls will run at the venues from 24-Apr-19 until 23-Oct-19. Upcoming show will be staged at Virginia/August Wilson Theatre - NY, New York; whereas the last one will be held at the Ohio Theatre - Columbus, Columbus. For the complete list of dates and venues, please visit our website. The average price for Mean Girls Tickets start from $356. The minimum get in price is $13 for Mean Girls Tickets at the Virginia/August Wilson Theatre - NY, New York. For a detailed look at ticket prices and amazing discounts, visit our website. Q:Can I buy Mean Girls tickets on the day of the event? A:Yes, you can purchase Mean Girls tickets on the day of the event. However, we will not recommend you doing that as these tickets have the tendency to sell out pretty fast. So, if you want to avoid the risk of missing out on this epic musical, it is best if you buy your tickets as soon as possible. Q:How can I pay for my Mean Girls tickets? A:If you are going to buy Mean Girls tickets from our website then please make sure to pay for them by using a valid credit or debit card. Please note that we won't be accepting payments made through cash as our website's policy doesn't support this option. Q:Are mean girls Broadway tickets offered at a Discount? 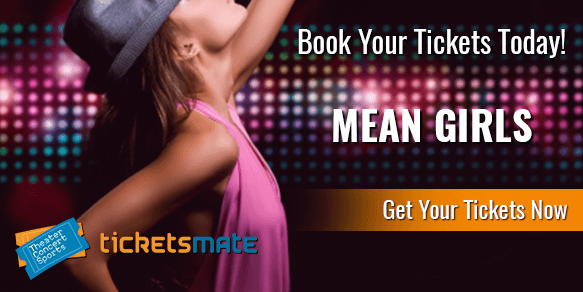 A:Mean girls tickets are offered at their original prices which are determined according to the market prevailing conditions of demand and supply. Hence prices are subject to variations but the price is set according to the market price in the industry. For now the current average ticket price stands at $552. Q:Do you have Mean Girls Tickets and information on it? A:Our brokers have Mean Girls tickets for its 2018 shows. These shows are scheduled at the Virginia/August Wilson Theatre, New York starting from March till September 2018. If you go to the event page you can find all the relevant details of the musical in detail, along with prices and dates. It is one of the most anticipated musicals so do not miss it and secure the tickets fast.